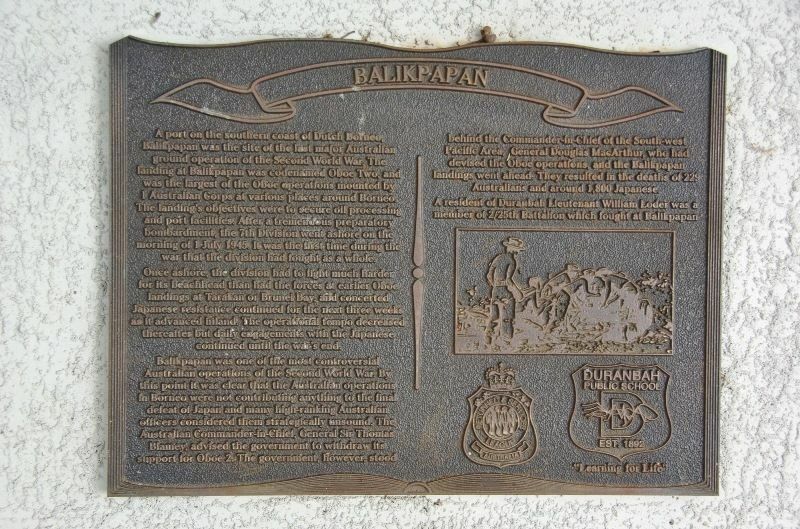 The plaque commemorates those who served in Balikpapan during World War Two. Balikpapan was the site of the last major Australian ground operation of the Second World War. The landing at Balikpapan was codenamed Oboe Two, and was the largest of the Oboe operations mounted by 1 Australian Corps at various places around Borneo. The landing's objectives were to secure oil processing and port facilities. After a tremendous preparatory bombardment, the 7th Division went ashore on the morning of 1 July 1945. It was the first time during the war that the division had fought as a whole. Once ashore, the division had to fight much harder for its beachhead than had the forces at earlier Oboe landings at Tarakan or Brunei Bay, and concerted Japanese resistance continued for the next three weeks as it advanced inland. The operational tempo decreased thereafter but daily engagements with the Japanese continued until the war's end.